This article is about the mineral or gem. For other uses, see Mica (disambiguation). 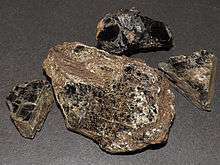 Until the 19th century, large crystals of mica were quite rare and expensive as a result of the limited supply in Europe. However, their price dramatically dropped when large reserves were found and mined in Africa and South America during the early 19th century. 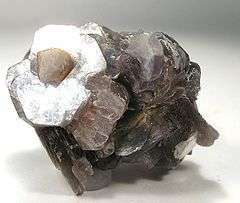 The largest documented single crystal of mica (phlogopite) was found in Lacey Mine, Ontario, Canada; it measured 10 × 4.3 × 4.3 m and weighed about 330 tonnes. Similar-sized crystals were also found in Karelia, Russia. Scrap and flake mica is produced all over the world. In 2010, the major producers were Russia (100,000 tonnes), Finland (68,000 t), United States (53,000 t), South Korea (50,000 t), France (20,000 t) and Canada (15,000 t). The total production was 350,000 t, although no reliable data were available for China. Most sheet mica was produced in India (3,500 t) and Russia (1,500 t). Flake mica comes from several sources: the metamorphic rock called schist as a byproduct of processing feldspar and kaolin resources, from placer deposits, and from pegmatites. Sheet mica is considerably less abundant than flake and scrap mica, and is occasionally recovered from mining scrap and flake mica. The most important sources of sheet mica are pegmatite deposits. Sheet mica prices vary with grade and can range from less than $1 per kilogram for low-quality mica to more than $2,000 per kilogram for the highest quality. People can be exposed to mica in the workplace by breathing in dust. The leading use of dry-ground mica in the US is in joint compound for filling and finishing seams and blemishes in gypsum wallboard (drywall). The mica acts as a filler and extender, provides a smooth consistency, improves the workability of the compound, and provides resistance to cracking. In 2008, joint compound accounted for 54% of dry-ground mica consumption. In the paint industry, ground mica is used as a pigment extender that also facilitates suspension, reduces chalking, prevents shrinking and shearing of the paint film, increases resistance of the paint film to water penetration and weathering, and brightens the tone of colored pigments. Mica also promotes paint adhesion in aqueous and oleoresinous formulations. Consumption of dry-ground mica in paint, the second ranked use, accounted for 22% of the dry-ground mica used in 2008. Ground mica is used in the well-drilling industry as an additive to drilling fluids. The coarsely ground mica flakes help prevent the loss of circulation by sealing porous sections of the drill hole. Well drilling muds accounted for 15% of dry-ground mica use in 2008. The plastics industry used dry-ground mica as an extender and filler, especially in parts for automobiles as lightweight insulation to suppress sound and vibration. Mica is used in plastic automobile fascia and fenders as a reinforcing material, providing improved mechanical properties and increased dimensional stability, stiffness, and strength. Mica-reinforced plastics also have high-heat dimensional stability, reduced warpage, and the best surface properties of any filled plastic composite. In 2008, consumption of dry-ground mica in plastic applications accounted for 2% of the market. The rubber industry used ground mica as an inert filler and mold release compound in the manufacture of molded rubber products such as tires and roofing. The platy texture acts as an antiblocking, antisticking agent. Rubber mold lubricant accounted for 1.5% of the dry-ground mica used in 2008. As a rubber additive, mica reduces gas permeation and improves resiliency. Wet-ground mica, which retains the brilliancy of its cleavage faces, is used primarily in pearlescent paints by the automotive industry. Many metallic-looking pigments are composed of a substrate of mica coated with another mineral, usually titanium dioxide (TiO2). The resultant pigment produces a reflective color depending on the thickness of the coating. These products are used to produce automobile paint, shimmery plastic containers, high quality inks used in advertising and security applications. In the cosmetics industry, its reflective and refractive properties make mica an important ingredient in blushes, eye liner, eye shadow, foundation, hair and body glitter, lipstick, lip gloss, mascara, moisturizing lotions, and nail polish. Some brands of toothpaste include powdered white mica. This acts as a mild abrasive to aid polishing of the tooth surface, and also adds a cosmetically pleasing, glittery shimmer to the paste. Mica is added to latex balloons to provide a colored shiny surface. Mica is also used as an insulator in concrete block and home attics, and can be poured into walls (usually in retrofitting uninsulated open top walls). Mica may also be used as a soil conditioner, especially in potting soil mixes and in gardening plots. Greases used for axles are composed of a compound of fatty oils to which mica, tar or graphite is added to increase the durability of the grease and give it a better surface. Sheet mica is used in electrical components, electronics, isinglass, and atomic force microscopy. Other uses include diaphragms for oxygen-breathing equipment, marker dials for navigation compasses, optical filters, pyrometers, thermal regulators, stove and kerosene heater windows, radiation aperture covers for microwave ovens, and micathermic heater elements. Mica is birefringent and is therefore commonly used to make quarter and half wave plates. Specialized applications for sheet mica are found in aerospace components in air-, ground-, and sea-launched missile systems, laser devices, medical electronics and radar systems. Mica is mechanically stable in micrometer-thin sheets which are relatively transparent to radiation (such as alpha particles) while being impervious to most gases. It is therefore used as a window on radiation detectors such as Geiger-Müller tubes. Small squared pieces of sheet mica are also used in the traditional Japanese Kodo ceremony to burn incense. The sheet of mica is placed on top of a cone made of white ash, which contains a burning piece of coal, acting as a separator between the heat source and the incense, in order to spread the fragrance without burning it. 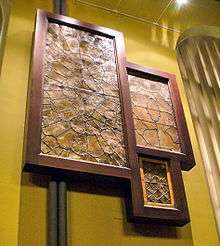 Thin transparent sheets of mica called "isinglass" were used for peepholes in boilers, lanterns, stoves, and kerosene heaters because they were less likely to shatter than glass when exposed to extreme temperature gradients. Such peepholes were also used in "isinglass curtains" in horse-drawn carriages and early 20th century cars. Throughout the ages, fine powders of mica have been used for various purposes, including decorations. Powdered mica glitter is used to decorate traditional water clay pots in India, Pakistan and Bangladesh; it is also used on traditional Pueblo pottery, though not restricted to use on water pots in this case. The gulal and abir (colored powders) used by North Indian Hindus during the festive season of Holi contain fine crystals of mica to create a sparkling effect. The majestic Padmanabhapuram Palace, 65 km (40 mi) from Trivandrum in India, has colored mica windows. In Ayurveda, the Hindu system of ancient medicine prevalent in India, has employed purification and processing of mica and preparing Abhraka bhasma which is employed in treating diseases of respiratory or digestive tract. 1 2 "Mineralogy: Phyllosilicates". Colgate University. 1997. Retrieved 18 April 2016. ↑ Rickwood, P. C. (1981). "The largest crystals" (PDF). American Mineralogist. 66: 885–907. ↑ "The giant crystal project site". Retrieved 2009-06-06. 1 2 3 4 5 6 7 8 9 10 11 Dolley, Thomas P. (2008) "Mica" in USGS 2008 Minerals Yearbook. ↑ "CDC – NIOSH Pocket Guide to Chemical Hazards – Mica (containing less than 1% quartz)". www.cdc.gov. Retrieved 2015-11-27. ↑ Weisenhorn, A. L. (1991). "Atomically resolved images of bismuth films on mica with an atomic force microscope". Journal of Vacuum Science & Technology B: Microelectronics and Nanometer Structures. 9 (2): 1333. doi:10.1116/1.585190. ↑ Marchant, R. E.; Lea, A. S.; Andrade, J. D.; Bockenstedt, P. (1992). "Interactions of von Willebrand factor on mica studied by atomic force microscopy". Journal of Colloid and Interface Science. 148: 261. doi:10.1016/0021-9797(92)90135-9. ↑ Singh, S; Keller, D. J. (1991). "Atomic force microscopy of supported planar membrane bilayers". Biophysical Journal. 60 (6): 1401–10. doi:10.1016/S0006-3495(91)82177-4. PMC 1260200 . PMID 1777565. ↑ Thundat, T; Allison, D. P.; Warmack, R. J.; Brown, G. M.; Jacobson, K. B.; Schrick, J. J.; Ferrell, T. L. (1992). "Atomic force microscopy of DNA on mica and chemically modified mica". Scanning microscopy. 6 (4): 911–8. PMID 1295085. ↑ Fagan, Garrett G. (2006). Archaeological Fantasies: How Pseudoarchaeology Misrepresents the Past and Misleads the Public. New York: Routledge. p. 102. ISBN 0415305934. ↑ Dehlvi, Sadia (October 14, 2007). "Tradition and modernity". Dawn.com. Archived from the original on October 20, 2013. ↑ Ramzi, Shanaz (March 31, 2005). "Fashion through the ages". Dawn.com. Archived from the original on October 20, 2013. ↑ "Abhraka Bhasma Preparation, Indications and Properties" "Ayurmedinfo.com". ↑ "Abhraka Bhasma Properties and uses". "ayurtimes.com"
Wikimedia Commons has media related to Mica.